If you are hearing a squeaking noise or having some brake problems, don’t wait any longer. Call now and let us take a look at your car. Once we have done a basic brake check – You will know the extent of the problem and how much it will cost to fix it. Brake repair cost will vary depending on what needs to be done to make sure your car is safe to drive. We will perform a basic brake check to determine the extent of any problems. If you hear any brake noise such as screeching, squeaking or grinding, you should immediately have your brakes checked. There are several things that can go wrong with brakes. Worn out brake pads, calipers and drums might be the issue, but it could also be a problem with your master cylinder, individual wheel cylinders or simply a lack of fluid. Your brake repair price will depend on what is wrong with your vehicle. Low Fluid The easiest of brake problems simply involves a low amount of brake fluid in the master cylinder. Topping off the fluid is the way to fix it, but, if the master cylinder is empty, pouring fluid in will push air into the system. To fix this we will need to bleed the brakes. Worn Pads or Drums A common brake problem is worn pads and drums. Brakes use friction to stop the car, and friction causes wear on the brake pads. After a while, brake pads must be replaced. You will detect a need to replace pads if you hear a squeaking noise when you press on the brakes. If it goes on too long without being replaced, you may have to replace the drums and rotors as well. What could have been a relatively inexpensive fix is now more expensive. Master Cylinder/Wheel Cylinders The master cylinder is where the brake fluid is stored and through pressure, sent to each wheel cylinder. This fluid is what applies force to the pads and drums when you press down on the brake pedal. If the master cylinder goes bad, when you press the brake pedal, it might take longer to stop the car. Your braking power is greatly reduced and it could be very dangerous. The cost of master cylinder repair depends on the scope of the fix. If individual wheel cylinders need to be replaced, the cost will go up. The repair price for an entire brake job—rotors, calipers, drums, pads, cylinders, can be very expensive. Therefore, it’s best to stay on top of brake repair and get the pads replaced when you hear squeaking. Components like master cylinders eventually wear down, so it will have to be replaced at some point. Hud’s will NEVER bait and switch! The Bait – A brake repair shop will advertise an unbelievable deal. Sometimes the offer seems too good to be true like… lifetime brakes for only $99.00. The hope is that you will bring your car into their shop. The Switch – Once your car is in their shop, you get the switch. The great deal you thought you were getting turns into a nightmare. The shop calls and says you need rotors turned, hoses replaced and a list of 10 more things that add up to over $500.00. Now you are stuck. Your $99 brake job just went up to more than $500.00. You really want to get a second opinion, but your car is in the shop. So, you end up spending a lot more money than you expected. Hud’s Auto Service will never do this. You will not have any surprises and you will not be sold something you don’t need. 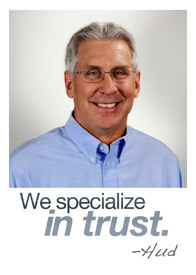 We have built a reputation of providing trust and quality service for over 22 years. We want you to be a lifetime customer and use Hud’s Auto Service every time your car needs service. If you can get great service at a fair price, we believe you will keep coming back to Hud’s Auto Service for all your car repair needs.